Continuing professional development and culinary training for food service staff. The School Food Initiative conducted week-long Culinary Boot Camps for food service staff throughout Santa Barbara County. Working alongside Chef Instructors and their peers, attendees practiced the skills required to integrate more scratch cooking techniques into school kitchens. On campus, Chef Instructors provided hands-on support to integrate new recipes, more efficient production methods, and local ingredients into school kitchens. Over the past fifty years, schools stopped cooking from scratch and switched to highly processed heat-and-serve food, heavy in salt, fat, and sugar, which has contributed to rising rates of childhood obesity and chronic illness. In making this switch, schools lost both skilled workers and the cooking and dishwashing equipment necessary for preparing healthy meals. Through the School Food Initiative (SFI), the Orfalea Foundation set out to reverse this trend and help schools become centers of health and wellness. The Foundation hired a consultant to conduct a Needs Assessment in late 2007 and early 2008, seeking to answer the question, “What would it take to produce wholesome, scratch-cooked food in our local schools?” Respondents indicated that culinary training and funding for new equipment were two obstacles that could be overcome with assistance from the Foundation. A five-day Culinary Boot Camp was designed to provide professional development and culinary training for food service staff. The program was developed by professional chefs to specifically address the needs of school kitchens. Keeping in mind the stringent requirements that school food service personnel must adhere to, as well as the unique limitations of school facilities and budgets, Boot Camp offered practical techniques and production methods for bringing scratch cooking to schools in a cost- and labor-efficient manner. In addition to continuously refining Boot Camp curriculum, the Foundation noted that food service workers and managers needed ongoing support to adapt their Boot Camp learnings to the daily realities of individual campuses. Boot Camp lit a spark, but ongoing practice and support fanned that spark into a flame. Chef Instructors visited school kitchens to offer hands-on support integrating new menu options and recipe expansion tactics, practicing more efficient production methods, and reintroducing local ingredients into school kitchens. In 2009, SFI had only one part-time chef providing assistance in the field, covering a county comprised of 21 school districts. By 2012 it had built a team of four chefs providing field support, including recipe development and testing, menu planning, improvement of food safety and sanitation practices, and ongoing instruction of institutional production methods. Sharing best practices across districts, our Chef Instructors helped employees identify and overcome obstacles that stood in the way of scratch cooking. Empowering local school districts to produce and serve nutritious, scratch-cooked meals was at the heart of the School Food Initiative’s efforts to improve the health and life outcomes for children in Santa Barbara County. Today, over 50,000 students in the Santa Barbara County public schools have access to nutritious, scratch-cooked meals at school. 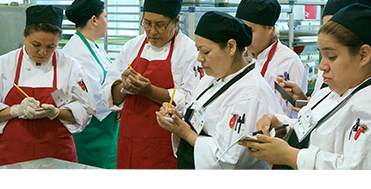 Culinary Boot Camp and Onsite Chef Support transformed the food on the plate and sparked a much larger cultural change on campuses, which now aspire to be community centers of health and wellness. Culinary Boot Camp and Onsite Chef Support professionalized the workforce and changed the standard operating procedures in food service. New hires arrive in an environment that takes scratch cooking for granted. Throughout Santa Barbara County School Districts, superintendents, teachers, and staff have embraced the idea that campuses can be centers of health and wellness. To ease the transition for other districts, tools — including the Culinary Boot Camp Training Guide — are available for download in the sidebar at right. More resources are also available at The Lunchbox.